Dark Side is proud to announce our affiliation with Taylor Motorsports Products. Founded in 1979, Taylor Motorsports has been on the leading edge of safety innovation combining an eye for detail, perfection and quality with the most challenging safety needs of competitors in drag racing to open wheel to off road and more. Today, Taylor Motorsports Products has a comprehensive line of hundreds of custom designed and hand made products from driver’s suits to complete restraint systems. It's cross border shopping and recertification made easy: Order your Taylor safety products from Dark Side and forget about all of the hidden incidental costs. No Customs or Duty; no notes left on your door telling you that you missed the delivery truck. *Keep watch for Dark Side's "Re-certification Made Easy" service. Contact Dark Side for your quote. Hats off to John Moore and the Nifty Fifty's Ford Club. With over 500 cars in attendance, I think it's safe to say that the 2013 Spring Thaw Car Show was a huge success. 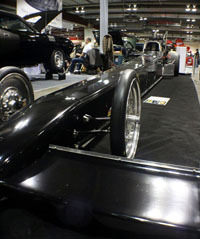 Dark Side Racing was in attendance with our Top Fuel Dragster and our Dart. We couldn't have asked for a better crowd! Finally, the official kick off to the 2013 Car Show Season! 3) 9" moser 31 spline, 44-48"
4) NEW 8.8" moser 31 spline, 40-44"
Dark Side Racing was thrilled to be a part of this years World of Wheels. We have to give a shout out to Tom and Cathy Meheden - they supplied a top notch venue for Calgary's gearheads and car buffs! Calgary is home to some incredibly passionate drag racing enthusiasts and we weren't at all surprised that almost everyone we chatted with (and there were many!) asked us about the status of Rockyview Motorsports Park. Sadly, our inquiries remain unanswered so, at this time, no new information appears to be forthcoming. Rest assured, we will keep you up to date if we hear anything. 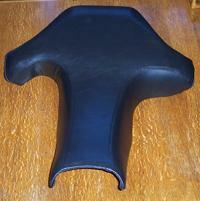 Dark Side manufactures professionally sewn replacement motorcycle seat covers for ATV's, motorcycles, scooters and trails bikes. Don't delay - Spring will be here before you know it. Top Fuel cars will return to IHRA full time in 2013.